Day Chemical Plant, Westline, Pa., 1900. The early history of the Kinzua Valley and it's development can be told primarily through the lives of Thomas Kane and his son, Elisha Kent Kane - two of McKean County's most prominent early citizens. Thomas Kane was a decorated Civil War general who had a vision to develop the coal and timber resources in the area. Kane saw to the construction of the Kinzua Bridge to cross the formidable Kinzua Valley, whose steep slopes separated him from his goal of accessing the bountiful coal resources located south of that valley. His solution? Build the tallest railroad bridge in the world. Considered one of the greatest engineering marvels of the 19th century, the Kinzua Bridge stood for more than 100 years until a tornado toppled it's central towers in 2003. Kinzua Bridge - before the fall. Elisha Kane, who was also a noted polar explorer, took over the reins of his fathers's business in the late 1800's. He soon built railroads to access timber resources in the area as well as a large lumber mill just downstream from his father's famous bridge. The site of the mill would become the village of Kushequa, later reknown for its brick manufacturing. Elisha then sought timbering property to the west, purchasing a huge tract of land spanning from Guffey (another small timbering camp to the west of Kushequa ) all the way to Meade Run near what is now the tailwaters of the Allegheny Reservoir. Through the land, he constructed the Valley Railroad to haul timber to his mill. The railbed for the train ran along the bottom of the Kinzua Valley and principally followed the contours of the Kinzua Creek. This provided an easy grade for the locomotives and allowed the main line to connect to various smaller spur lines that ran up tributaries feeding the creek. This gave rise to several isolated, rough-and-tumble timber camps along these lines harvest wood for market. The eastern end of the Valley Railroad started a bit up the valley from the Kinzua Bridge in the Village of Bachus, which is no longer in existence. From there it traveled under the bridge, passing through Kushequa, then along the valley past the villages of Guffey, Westline and Morrison, before meeting the Pennsylvania Railroad line at it's western terminus in the town of Kinzua. Today, there is nothing left of the latter two locations, as they were both flooded with the filling of the Allegheny Reservoir in 1960. As so many tracts of trees were felled, use of the Valley Railroad became less profitable for the various industries that had hitherto relied on it so heavily. Due to economic circumstances, sections of the track were gradually torn out and sold for scrap until the last remaining stretch cut through Westline - the western 'end of the line.' The section coming into Westline from the north was removed in 1936 and later turned into a highway. 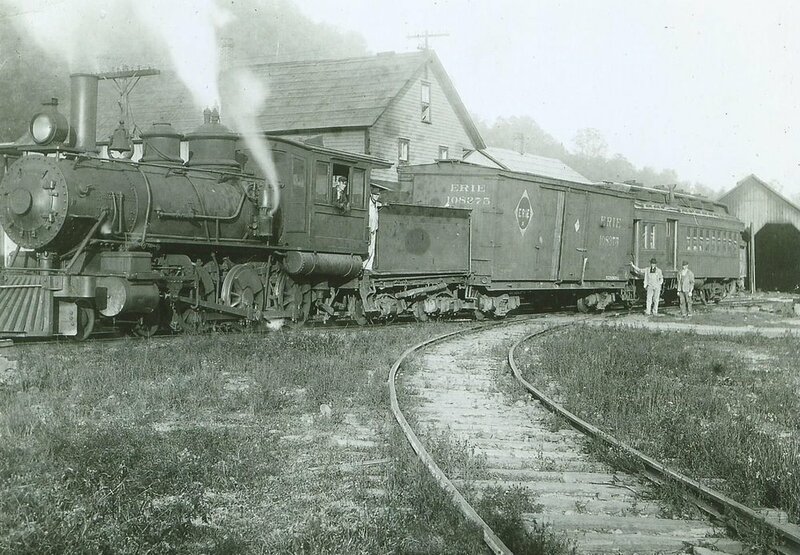 The Valley Railroad continued to operate from Westline to Kinzua, shortened incrementally until it finally came to be known as "The World's Shortest Railroad" - just 1 mile. his section ceased to function when the chemical plant in Westline, which had manufactured charcoal and acetic acid, was shuttered in 1953. The Valley Railroad eventually ran out of steam, and the sound of the big engines chugging through the Kinzua Valley passed into history.